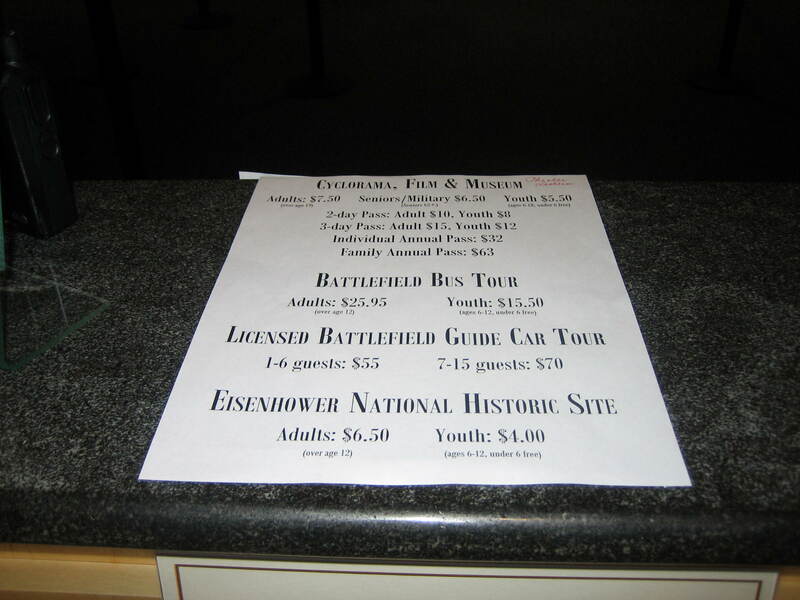 The $7.50 fee for adults wanting to see the Gettysburg Museum began today at the Visitor Center. The fee includes the New Birth of Freedom movie, the Cyclorama program, and the museum. 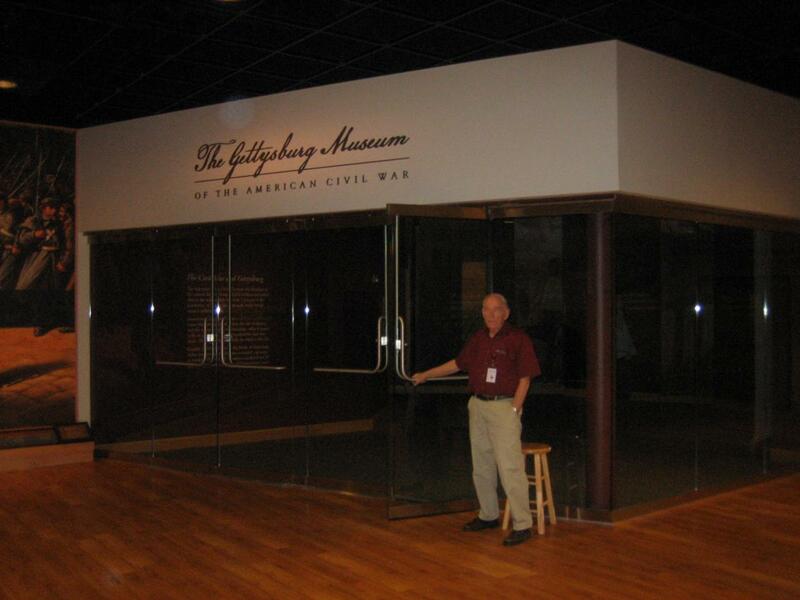 Visitors who wish to enter here, must show Gettysburg Foundation employees, such as this gentleman, their tickets. This view was taken from the southwest facing northeast at approximately 4:45 PM on Thursday, October 2, 2008. 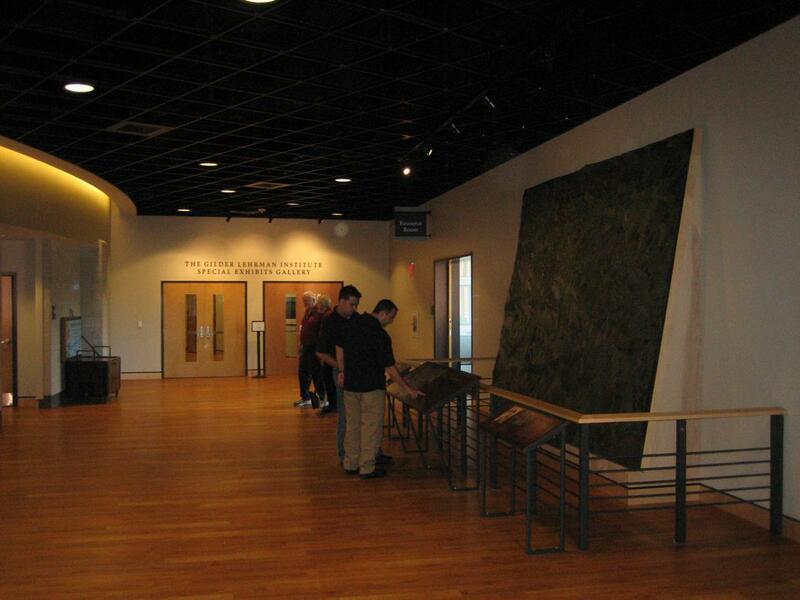 Today, for the first time, visitors who wish to view the Rosensteel Civil War Collection, which makes up the majority of the Gettysburg Civil War Museum, must pay a fee. The $7.50 fee for adults began today at the Gettysburg National Military Park Visitor Center. The fee includes the New Birth of Freedom movie, the Cyclorama program, and the museum. Gettysburg Foundation employees now stand outside the door to the museum entrance and ask them to show a ticket before allowing entry. However, for today at least, there are other ways to get into the museum. 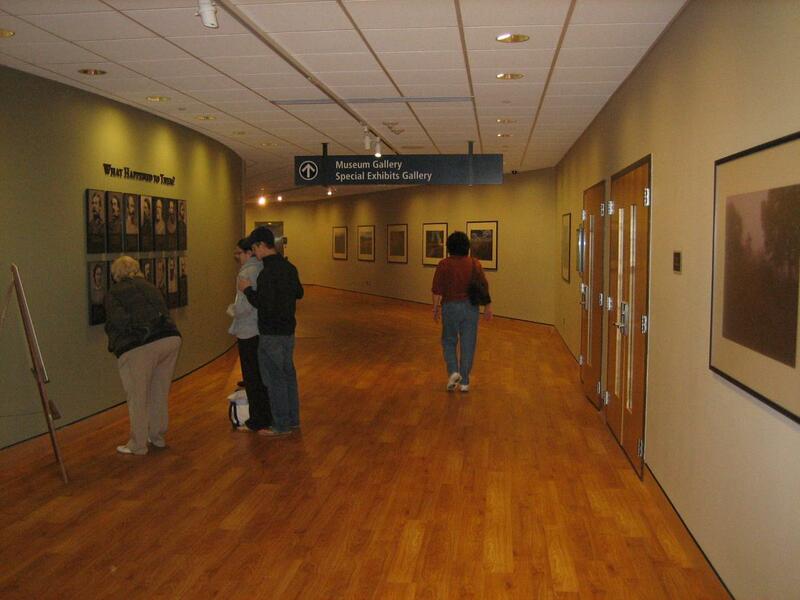 Visitors did not complain about the museum fee. Ticketing employees said that the only complaints that they had today were from visitors who didn’t want to pay $7.50 to see the Cyclorama. 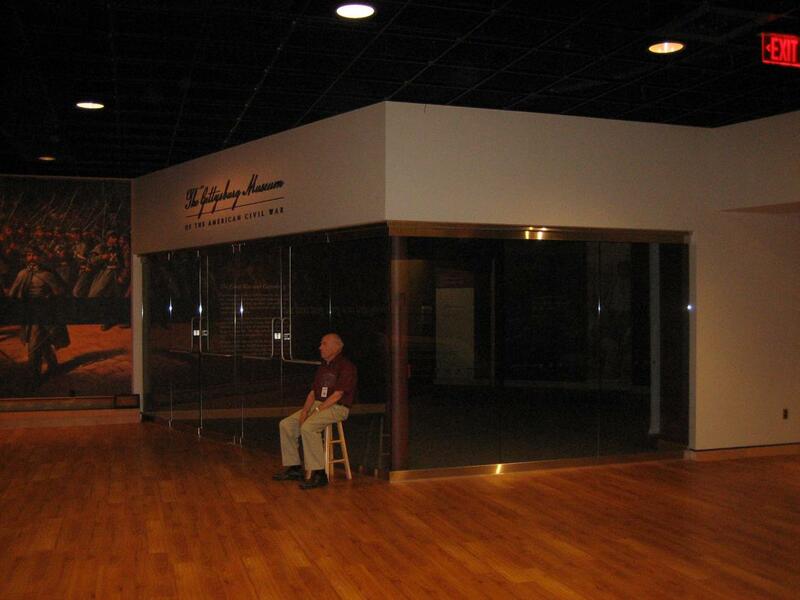 One female visitor remembered when the Cyclorama was last open and it cost $4.00 a person to see it. Now she and her husband must pay $15.00. 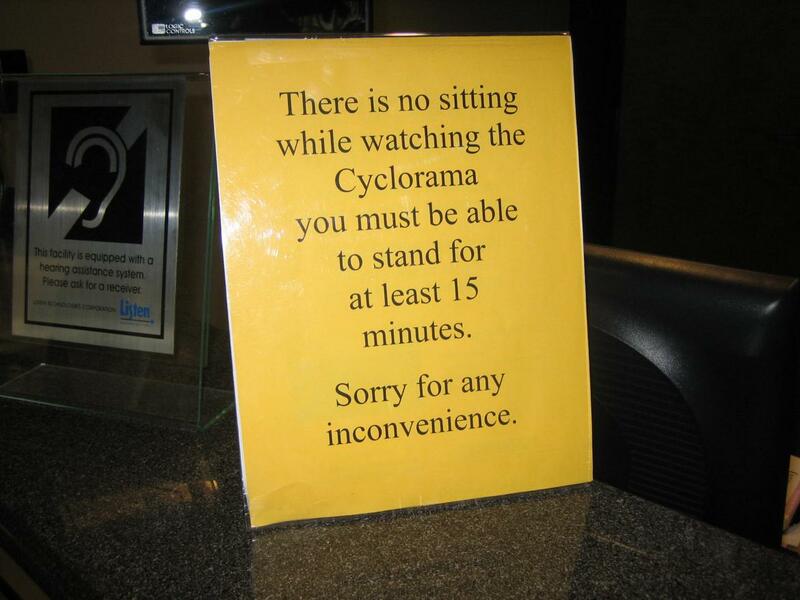 They didn’t care about the movie, or the museum, they just wanted to see the Cyclorama. This view was taken from the southeast facing northwest at approximately 4:45 PM on Thursday, October 2, 2008. The new fee structure for all the programs are posted in multiple locations. This view was taken from the south facing north at approximately 4:45 PM on Thursday, October 2, 2008. Here’s another problem some older visitors, and visitors without some stamina are having. We won’t bring up again the rejected idea of a rotating platform where visitors are seated at different levels at the Atlanta Cyclorama. Remember, the idea of this cyclorama is to transport visitors back to the 1880s when people also really didn’t care if you could stand for very long. This view was taken from the southeast facing northwest at approximately 4:45 PM on Thursday, October 2, 2008. About the only positive benefit of the new fee structure is that visitors who want to see the Cyclorama program again that day, may do it as many times as they are able, and for no extra charge. Visitors who wish to view the program again must go back to the ticketing desk, and exchange their old ticket for a new one. They must do this because some shows might be sold out, and they can’t just show up whenever they would like. 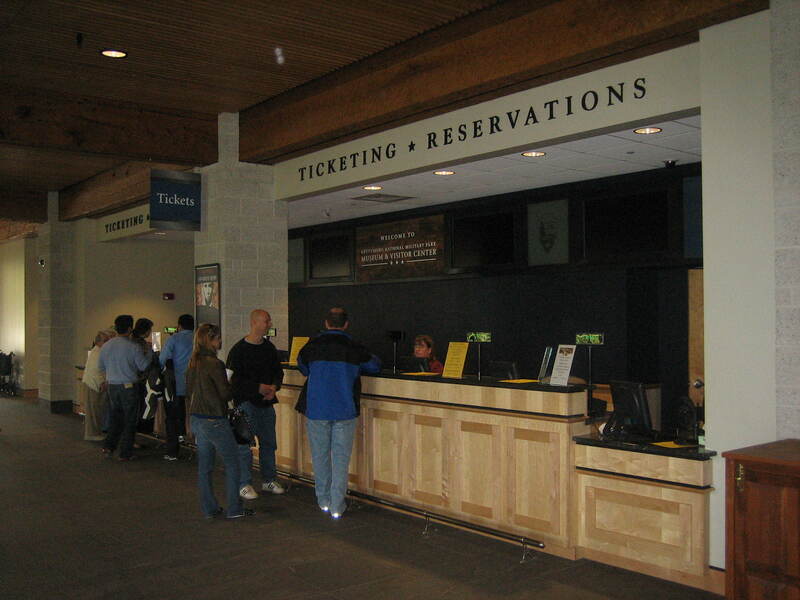 The main visitor complaint at this ticket taking location is that visitors who want to see the Cyclorama again, don’t want to sit through the movie again. This view was taken from the south facing north at approximately 4:45 PM on Thursday, October 2, 2008. 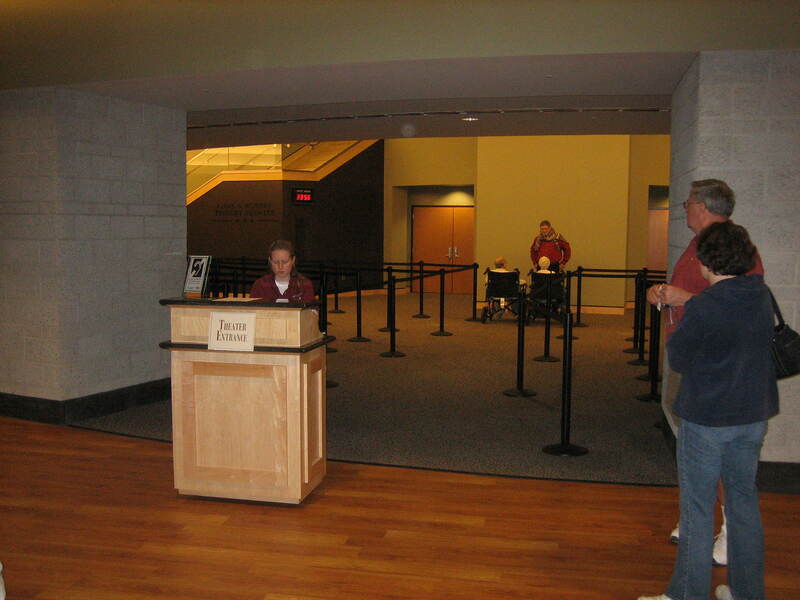 Of course if you don’t want to pay a fee to go into the museum, there are other entrances, that, at least for this afternoon were not being “guarded.” This view was taken from the east facing west at approximately 4:45 PM on Thursday, October 2, 2008. Go to the north side of the museum where the 1904 Relief Map is displayed. This view was taken from the east facing west at approximately 4:45 PM on Thursday, October 2, 2008. 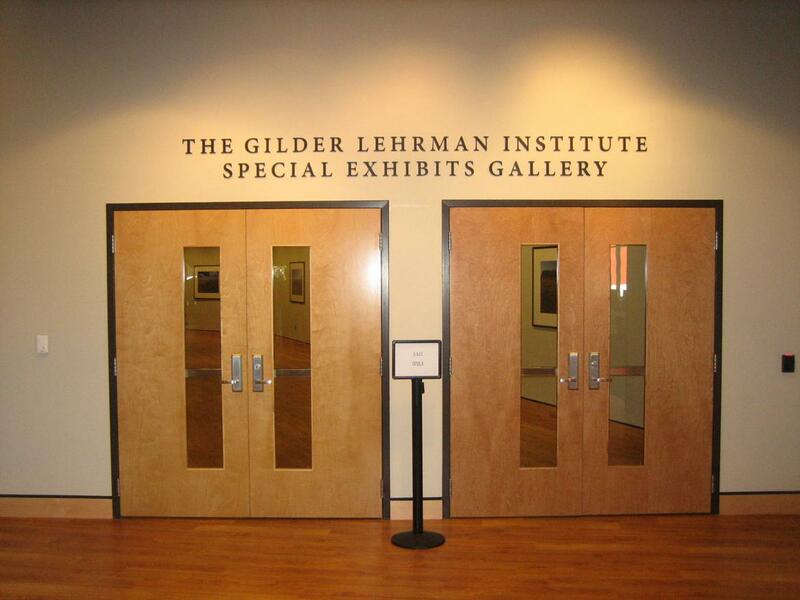 Go through these doors. This view was taken from the east facing west at approximately 4:45 PM on Thursday, October 2, 2008. 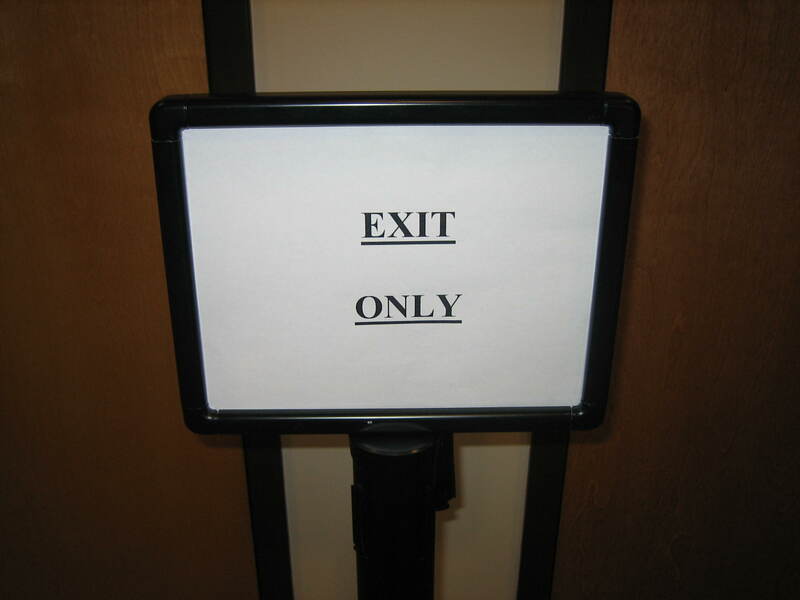 The sign says “Exit Only” but the handles on the doors turn and open anyway. This view was taken from the east facing west at approximately 4:45 PM on Thursday, October 2, 2008. 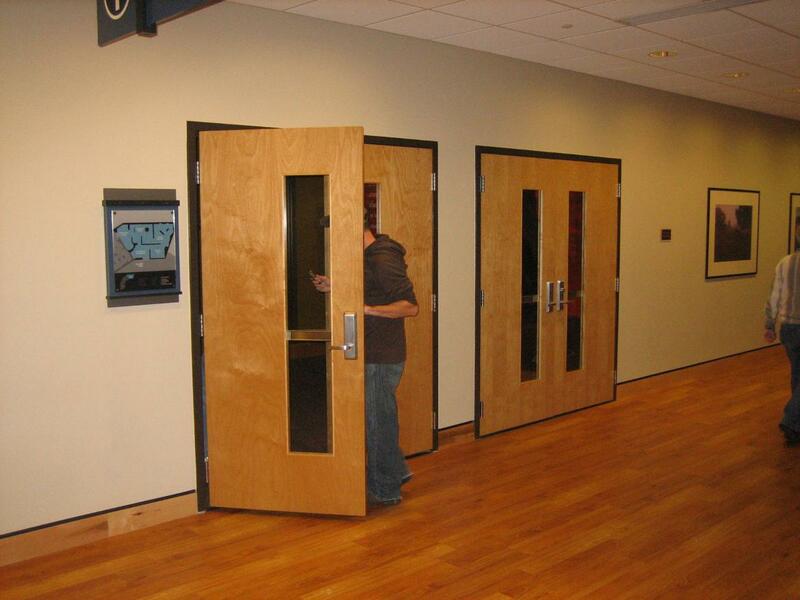 Go into the hallway and to the first doors on your right. This view was taken from the east facing west at approximately 4:45 PM on Thursday, October 2, 2008. And, as about six people did as we were watching here, go through the doors into the museum. You’ll be going backwards, but its not too hard to work your way to the beginning. This view was taken from the southwest facing northeast at approximately 4:45 PM on Thursday, October 2, 2008. 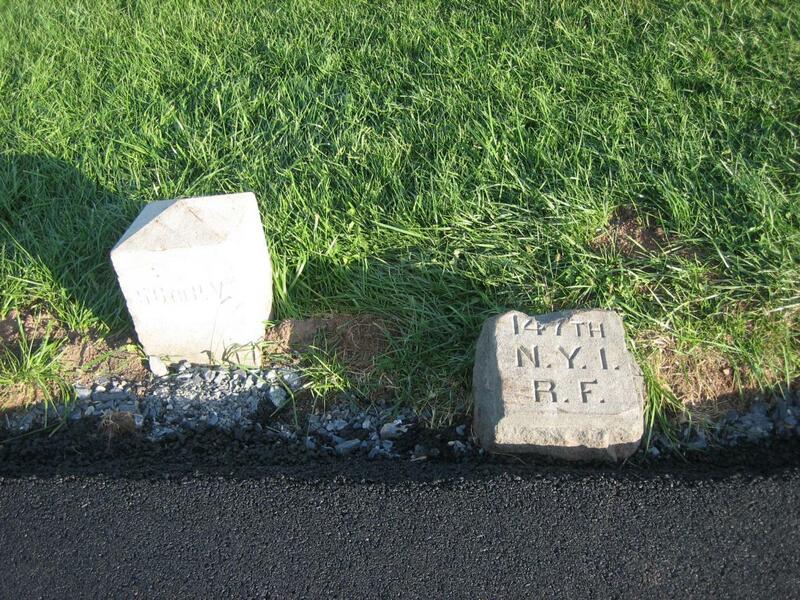 This is the third day that the right flank marker to the 147th New York has asphalt on it. This view was taken from the west facing east at approximately 5:10 PM on Thursday, October 2, 2008.